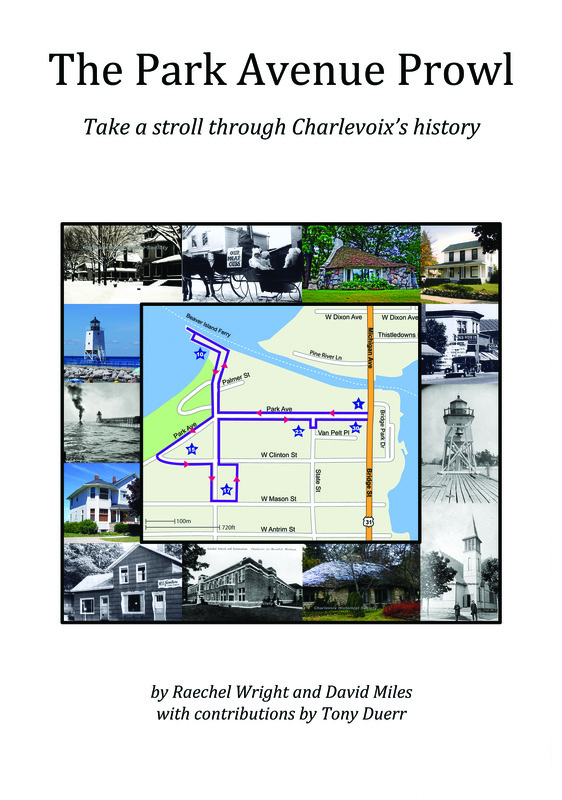 The Charlevoix Historical Society’s 2010 tour of 8 Earl Young homes on July 28 was a great success, and a sell-out. There is now talk of a repeat tour — maybe in 2012. 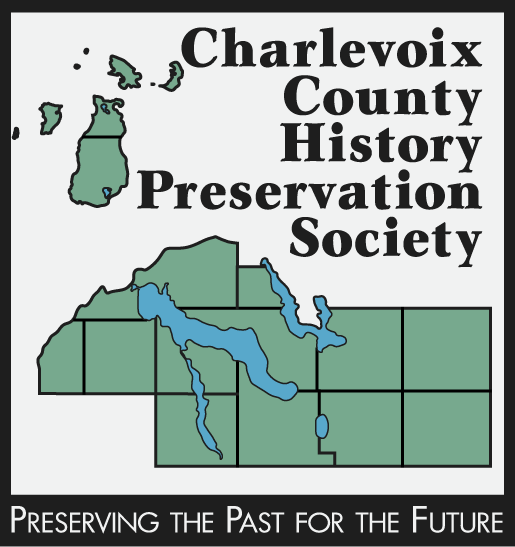 Watch the Society’s website at www.chxhistory.com. Hobbitland … mushroom homes … elf space … gnome houses … Smurfsville … the creations of Earl Young are known world-wide. And the only place you can see them is Charlevoix. Our tour will take you around the triangular block bounded by Park Avenue, Grant Street, and Clinton Street. 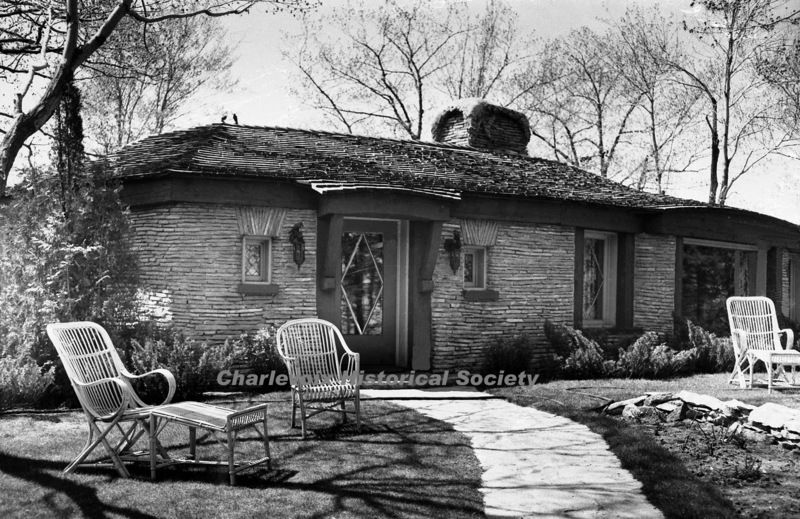 Here you can see some of the most famous, and most beloved, work of long-time Charlevoix resident, Earl Young, homes he built or remodeled beginning in the late 1930s, and culminating in the construction of the “mushroom house” in the 1950s. Earl Young lived most of his life in Charlevoix. 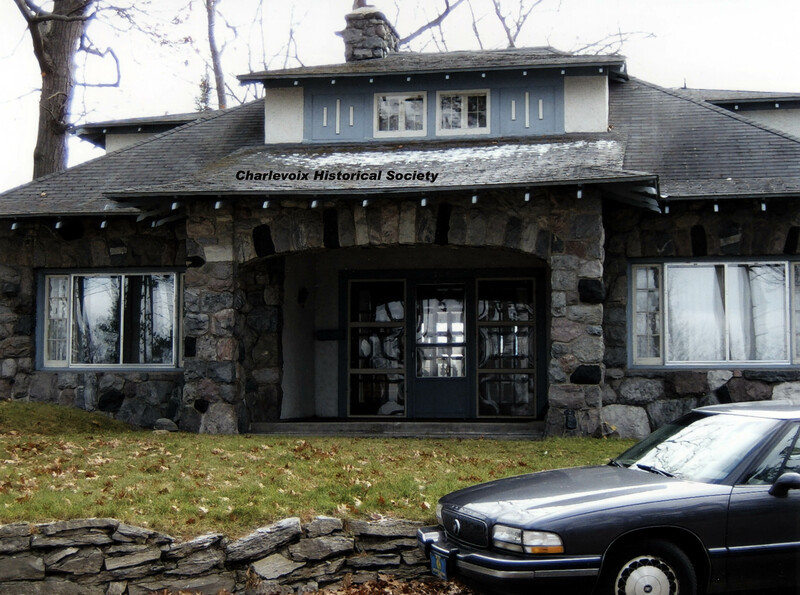 He graduated from Charlevoix High School in 1908 and studied architecture at the University of Michigan for one year. He married Irene Harsha, daughter of Horace Harsha, in 1915, and worked in real estate for more than 60 years. Following the manner of Frank Lloyd Wright, who argued that houses should blend organically into their surroundings, Young designed each home to fit its site. 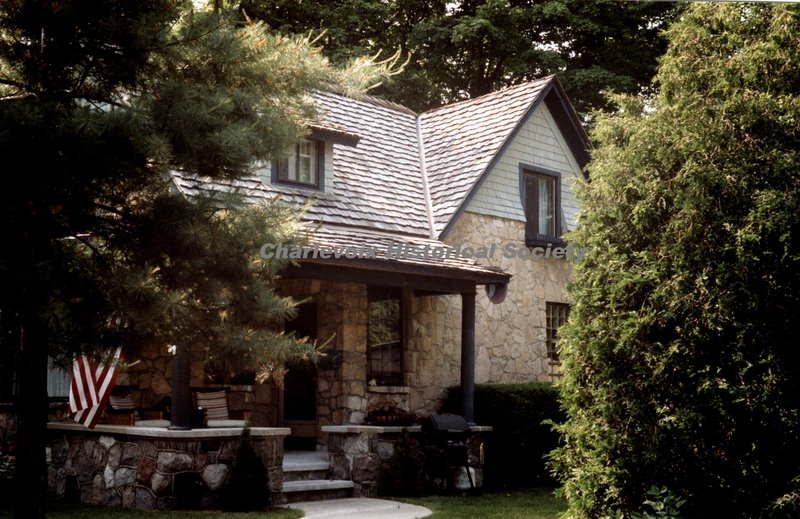 His signature style included liberal use of stone, including stone fireplaces, curved cedar shake roofs, and unusual chimneys that look like they come from fairy tales. Unlike Wright, it has been argued, Young’s homes have a warmth and whimsy that makes them a pleasure to live in, in spite of their obvious size limitations. And with one exception, the only place you can find a Young home is in Charlevoix. 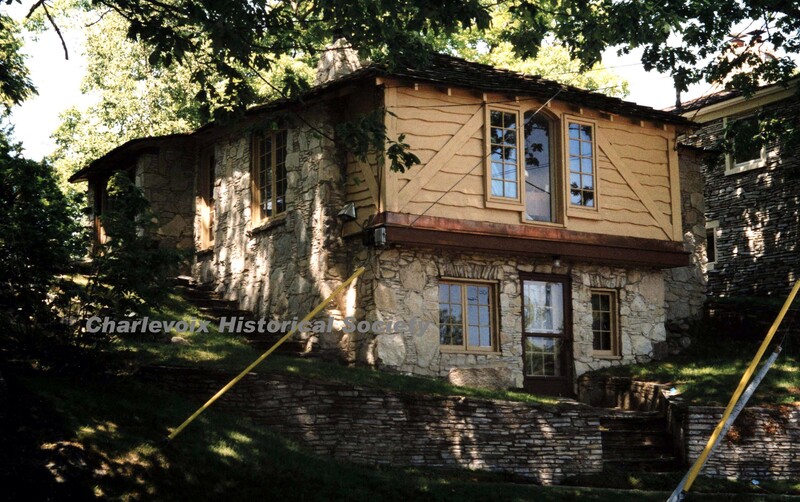 It all began in 1918 when Young began to build his own home, at 304 Park Avenue, for himself, his wife, and their growing family. 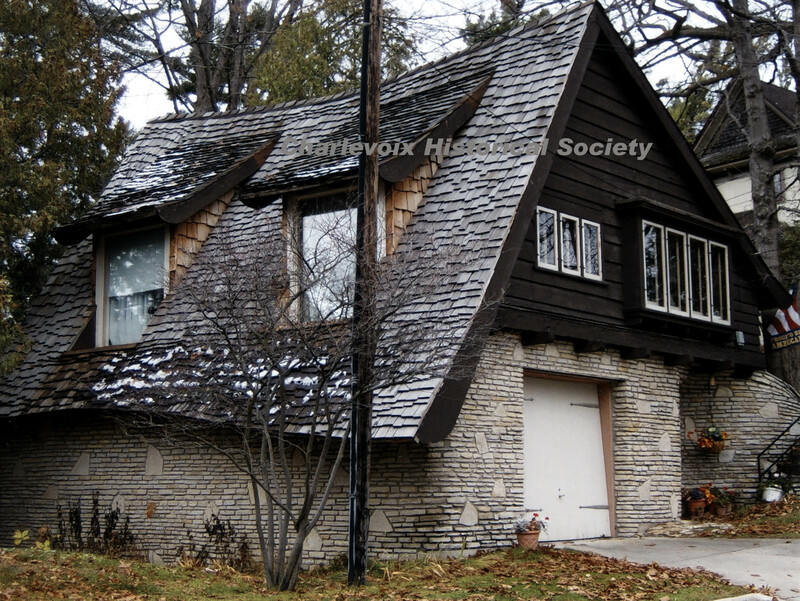 This home shows the influence of the American Arts and Crafts movement in its pronounced horizontality, wide eaves, and exposed rafter tails. The “Half House” at 302 Park Avenue was built by Young in 1947. It is the smallest of his houses and one of the reasons his creations are known by their affectionate names. In 1946-47, Young built a home for himself and his wife Irene at 306 Park Avenue. 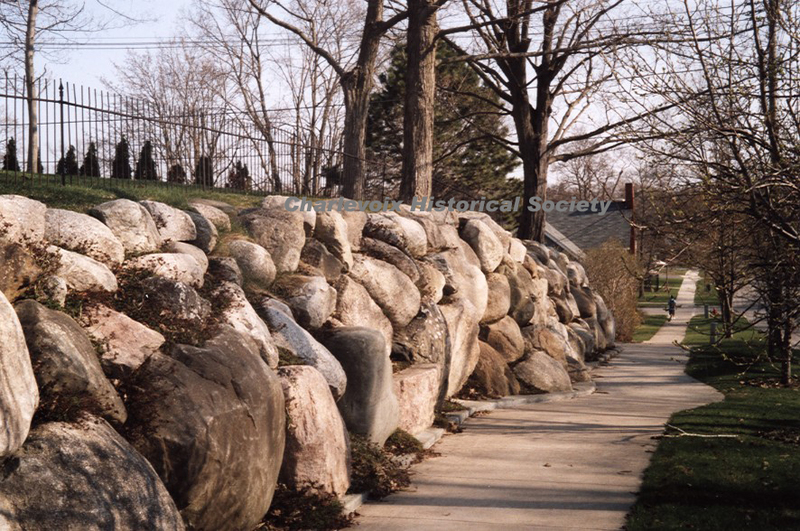 It shows his fascination with Onaway stone, an easily detached and workable rock that comes from a quarry near Onaway, about 50 miles east of Charlevoix. The lines of the house echo the lines of the small knoll on which it stands. The frosted cement chimneys are a favorite Young motif. 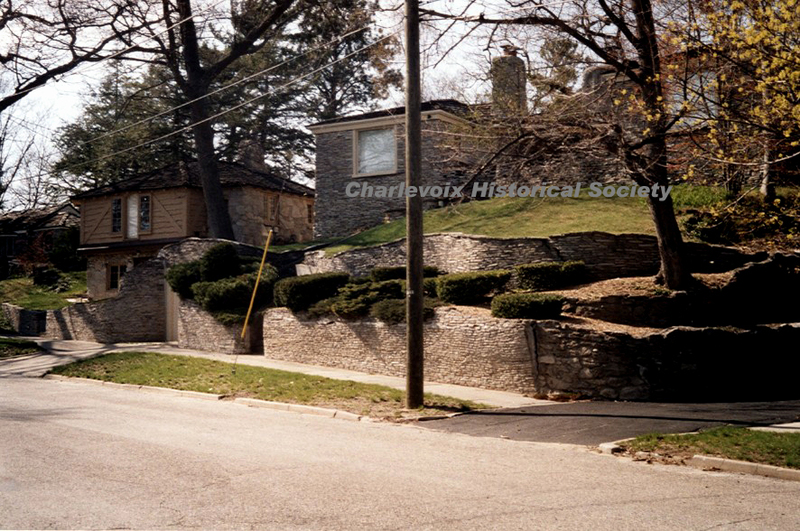 Below on the left is the rear view showing the terraces of Onaway Stone sweeping down to the Clinton Street sidewalk. This photo is taken from soutwest. On the right is the same view from the east. 308 Park Avenue, called “Betide” by Young, was built in 1943. It is three times larger than it looks as it extends out and drops down to Clinton Street behind. To the left is the front of the house; a rear view is below. 310 Park Avenue, called “Abide” by Young, was built in 1938. His eaves and lines over the windows are moving ever so subtly, as if he’s experimenting with forms that would, ina few years, make some of his rooflines fly. Young’s philosophy of respecting the shape of the lot, almost making it the element that shapes the house, is evident as Abide looks not so much like it was built on top of the land, but rose from it into the embrace of the trees that surround it. 305 Clinton St. is shown below, before and after Young remodeled it in 1961-1962. 303 Clinton St. was remodeled by Earl Young from 1952 to 1962. It is shown below. 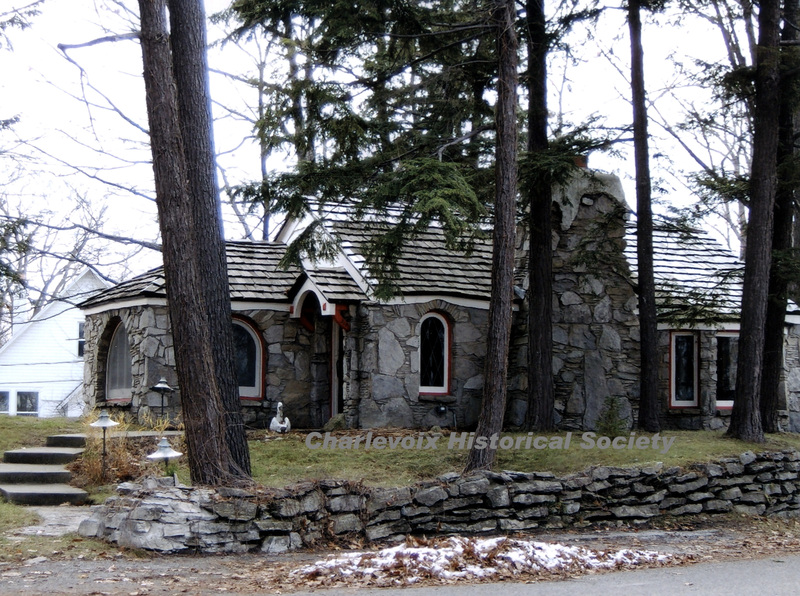 The “Mushroom House,” at the corner of Clinton and Grant Streets, is the most photographed residence in Charlevoix. It is considered to be Young’s most beautiful home, built in 1951 and 1952. Some of the walls are three feet thick. The leaded pane windows are originally from a Polish castle, then a lumber baron’s mansion that was demolished. The rooms are so irregular that an exact square footage has never been determined. The current owner replaced the roof this year. 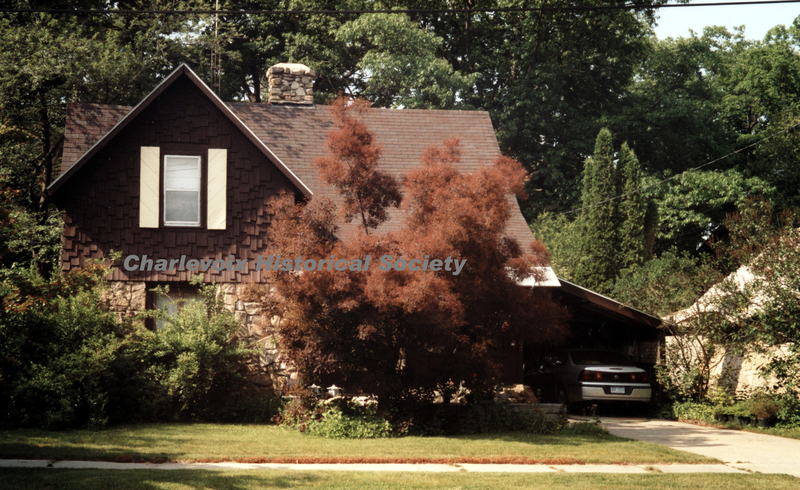 101 Grant Street, built on the foundation of the barn that used to belong to the house at 301 Clinton St. (the Mushroom House) in 1954, is shown below. 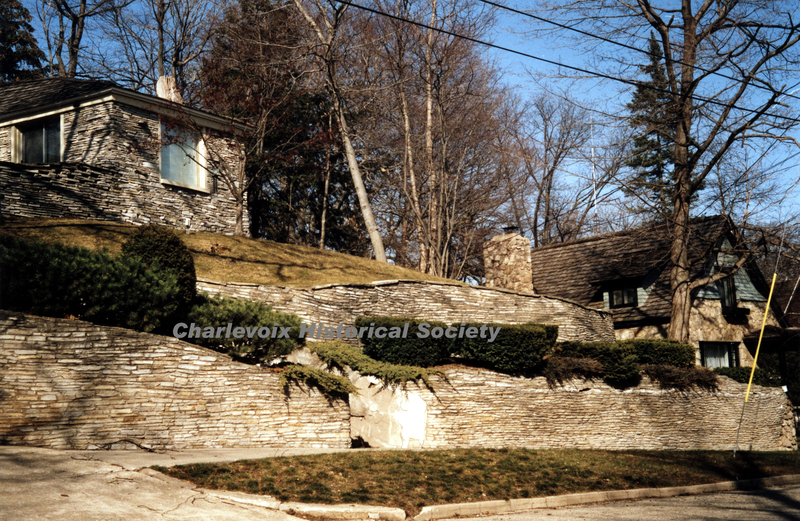 The stone wall extends from the far left corner of the house all the way around and up to the Park Avenue corner. As you return to Park Avenue on Grant, you’ll walk up this sidewalk (toward the camera) with a recently installed boulder retaining wall on your right. Hearty walkers can continue down Park Avenue and see more Young homes. 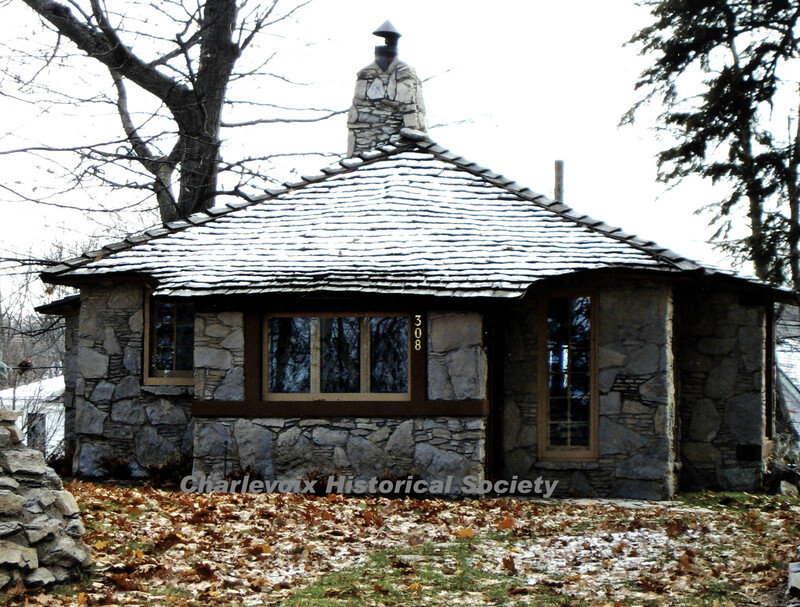 He purchased property along Lake Michigan west of Charlevoix in the mid-1920s, and developed the property known as Boulder Park, eventually building twelve stone homes there. In the July 9, 1924 issue of the Charlevoix Courier, Young advertised the 85 building sites in the subdivision, offering a “New Ford Coupe” to one of the first ten purchasers. Young also built several stone houses at the western end of Park Avenue, and several along the northern shore of Round Lake. In the mid-1950s, he built the Weathervane Inn on the site of the former Argo Milling Company, retaining most of the ground floor of that structure, including its 12 x 12 maple timbers. Its enormous stone fireplace was constructed with some difficulty, the largest boulder dropped into place by a crane after a portion of the roof was removed. At the time, the Weathervane Inn was described as an “ultra-modern restaurant” and a “cluster of exclusive shops”one of which was the Shop of the Gulls, owned, along with the entire complex, by Young himself. Young also maintained his own office, along with the shops, on the lower level of the restaurant. His office remained there for many years after Young sold the Inn. Young was a long-time Charlevoix booster and Chamber of Commerce member, instrumental in acquiring the property that would become the city’s East Park. Large pictorial maps of the area, drawn by his wife Irene Young in the 1930s and 1940s, were researched by Young. He died in 1975 at the age of 86. 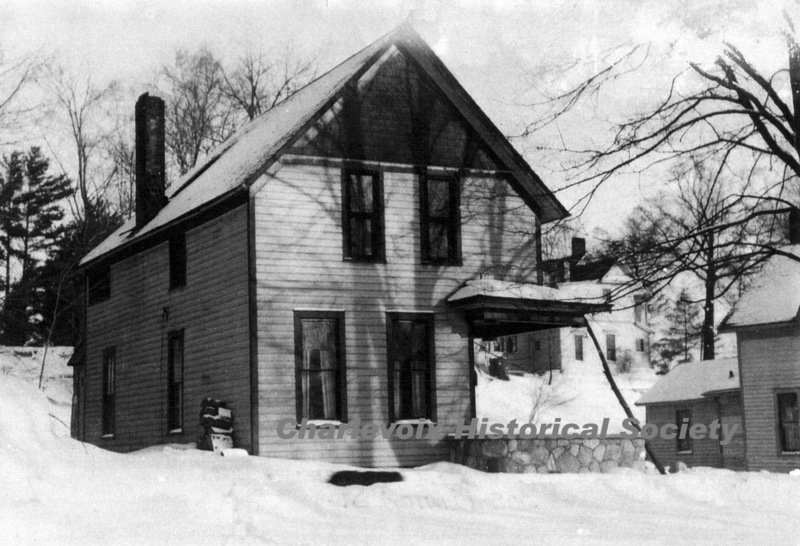 Copyright 2011 by Charlevoix County History Preservation Society All rights reserved. Has anyone ever seen data on how he built the roofs with the mushroom cap designs? I will ask around, Brenda. I did read an interview in which Young stated that he always designed the roof first, and then just made the walls meet the roof. Your question is interesting, though. I’ll let you know what I find. 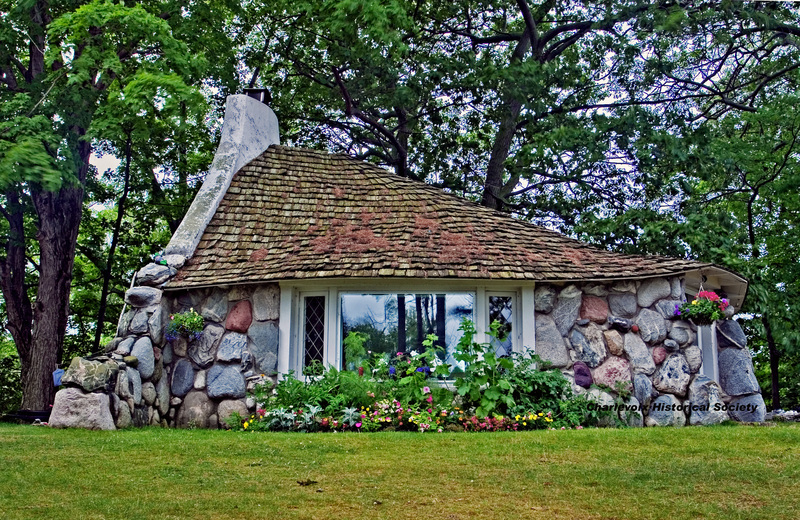 There is a house in Bayfield, Ontario, Canada that has got to be connected to Earl Young- so hobbitlike! Love his work! What an added delight it was to visit my friend Bob Bergman a year or so ago and have him show me some of the E.Young houses. They blew me away in their style, use of the land from which the houses appear to be a natural part of and native materials of which they are constructed. Mr. Young’s approach, love and whimsy in the placed in the homes make them a treasure for all who have the privilege of living in Charlevoix. Your town is one of the most beautiful towns that I have ever visited and just love it up there. I am looking forward to coming back for another visit. Enter your email address to be notified of new Park Avenue Prowl posts.